Let's face it, most everyone with a home studio mixes in the box these days. In fact, the smaller the studio, the more likely it's going to happen. But for those of us in the box, we still want that big analog sound that only a console or an analog summing mixer can bring. The problem is the cost, which was substantial - until now. Now there's the Unit Audio New Unit 16x2 analog summing mixer, a device that brings analog summing within reach of the masses at only $299. The New Unit has no frills and no controls, just analog summing. It features 16 balanced line inputs accessed via 2 D-Sub connectors plus a choice of either 1/4 inch TRS or XLR mic level output connectors. 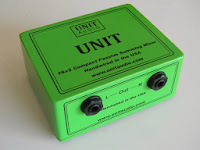 The New Unit is point-to-point wired and takes up a really small footprint on your desktop. It's hard to beat at $299 for the TRS outs and $335 for XRL outs. If you don't need 16 inputs, Unit Audio also makes an 8x2 model as low as $149. At that price, real analog summing is now within reach of every studio. ...but seriously... does a device like that make sense? ?